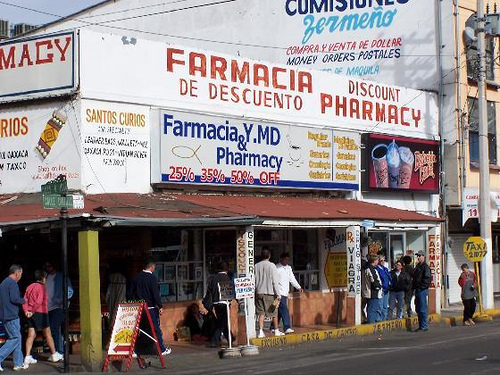 The drugstore that Mrs. Patricia Hydell pulled into was not her regular pharmacy, but a Mexican farmacia on the other side of town. The old sedan sputtered into a parking spot and she cut the engine. Red, white and green flags lined the roof of the building and flapped in the night. Patricia hadn’t expected a Hispanic superstore when she plugged ‘late night drugstore’ into her GPS and chose the farthest option from her home. The company-provided device never failed to get her to customers’ estates on time, and she had no reason to doubt it now. Though the directions guaranteed she’d arrived at her destination, Patricia scratched her head, couldn’t help but wonder. Patricia had always regarded the extra exclamation point as a little excessive, but nonetheless, she appreciated the festivity. And who didn’t like well wishes of prosperity? Patricia could use all the well wishing she could get. A single lamppost illuminated the parking lot. Black grackles dotted the telephone wires strung overhead. They screeched at each other like neighbors complaining about the heat. Nearly nine o’clock at night, and the Indian buffet and cell phone shop on either side of the drugstore flurried with activity. Dang! Now what on earth was anybody shopping for so late on a weeknight? Christmas was long over. These folks should go on home to be with their families. Patricia touched the rosary hanging from her rearview mirror and scanned the lot for familiar faces. Deep breaths, quick prayers. Now this is just silly, she thought, this predicament: a forty-five-year-old woman, afraid of a shopkeeper like some teenager trying to buy cigarettes. Patricia opened her car door against a mean wind. Her short hair coiled inside her collar and tickled her neck. She took a moment to brace herself, inhale the spicy cold. Then, time to be brave. The automatic doors, the first in the symphony of bells and whistles, signaled her arrival. The trumpets of mariachi tooted and trilled over rhythmic chitchat, oddly reassuring in its unfamiliarity. The cash register chimed to the beat. The only Spanish Patricia knew came from church, a few phrases and pleasantries she’d picked up over time, and the language swirled like lyrics around her. Oh, but now it was music to her ears. The speech-song assured Patricia complete anonymity. Just another shopper here to pick up a casual item. She glanced at the cashier, a young lady with a bored look on her face, ringing up a shopping cart full of junk. Patricia never thought she’d be so grateful for the indifference of teenage girls. Now, now, she thought, watching the girl examine and scan an item. Best cross that bridge when you come to it. The way to keep her purchase light and easy would be to lessen its significance. She could not have come for just one thing. This was, after all, a superstore. And my, what a store! The sheer amount of clutter struck a lightning bolt of anxiety through Patricia. What on God’s green earth was this place? ¡FARMACIA fantásticA! nearly blinded her. Everything from strands of Christmas lights to plastic chandeliers and disco balls blinked and flashed. Wowee, did it ever sparkle! In each aisle, the shelves stood twenty, thirty feet high, creeping up to the top of the warehouse. Piñatas shaped like cartoon characters, wild animals, and other crepe paper creatures hung from the ceiling. They dangled from various heights like colorful clouds blocking out the sunny fluorescent lighting. Get a move on, she thought to herself. Standing ’round gawking wouldn’t solve her family crisis. What was poor Lynn doing at home while her mother ran this errand? Pacing? Crying? Patricia might expect this sort of behavior from her son, but Lynn earned straight-As, buried her head in books. Her daughter was smarter than this. It was all a terrible sense of déjà vu. Except Patricia’s mother hadn’t gone out and bought the test for her. She’d braved the results alone. When it came time for deciding, Patricia up and married Buck, fled Amarillo for Austin. Here she was again, knees knocking together, hoping to God that there wasn’t a baby so soon in the future. Patricia steadied herself and grabbed a cart. The sweat on her palms slicked against the silver handle of the miniature shopping buggy. The aisle signs were all in Spanish, and the store seemed to extend for miles. Never mind the distance, no time to dilly-dally. A left turn, a grit of the teeth, she pushed on into the belly of this multi-colored, multi-cultured maze. She was a red-blooded Texan woman, and darn it, she could shop. A regular customer on a regular shopping excursion would simply ask a store employee for assistance locating her necessities. Patricia would rather die than ask for help. How would that go? Dónde está la pregnancy test? No sir, that wouldn’t do. She’d find it herself. As she hustled past a wall of fabric, Patricia reconsidered the word “farmacia.” Now what could it really mean? Dollar store? Party store? Tulle, chiffon, velvet, and lace hung from rods strung against the wall. Certainly it couldn’t translate to drugstore—not the usual, with shampoo and candy and ibuprofen. She figured the back of the store housed the pharmacy section, like at her regular shop. But with the miles of junk between her and it, she might as well have gone back to her own neighborhood. Patricia nodded and stared at the massive tower. The golden, syrupy liquid gleamed under the humming lights. Though the boy obviously spoke English, Patricia heard herself shouting slowly. Over ten years of maid service and she still didn’t like how it sounded. Domestic worker? Housekeeper? The title didn’t matter so much. Being paid in cash meant her husband never knew what her earnings looked like or where the money went. Besides, the work provided a strange tranquility. She didn’t mind cleaning up other people’s messes. A slideshow of people—friends, church members, neighbors, her children’s classmates—flashed through her mind. She glanced past the stock boy to sweep the store. No one even remotely familiar in sight. Satisfied, she returned her gaze to the pine-scented pyramid. A sign above it read, ¡Nuevo! ¡El Aroma de Limón! The sudden urge to kick the tower of cleaner swelled inside of her. “You a cleaning lady?” the stock boy asked, his eyebrows raised. She nodded stiffly, afraid to speak. Afraid she might really knock down the display. “Ah—what? No, I don’t think so.” She shrugged and forced a chuckle, shook her head in an exaggerated motion. Who was this young man peddling cleaning supplies when there were important things to do? Move it along, buster! But he looked so gosh darn excited. “All right, then. Thank you kindly.” Patricia waited for dismissal. He was, after all, being perfectly polite, doing his job. It would be rude to just walk away. She drummed her fingers on the cart handle. Her propriety would not hold much longer. Every moment spent pretending with this stranger in this strange store, of not getting what she needed and getting home to her daughter, equaled another second holding a bomb. The poor stock boy didn’t realize that her matters were life and death, earth shattering, life altering, the future decided tonight by a yes or no answer on a stupid pee stick. She tapped her foot hard and fast because she could not say what she wanted to say, which was GO ON AND Get! don’t you understand I can’t talk about this right now? “So, you want buy one, get one free?” he asked. If she really had been holding the bomb, this would have been the moment she’d have thrown it at him. “YES!” she shouted. With a flailing arm, she swept a row of pine cleaner into the miniature cart. The top tier of bottles crashed to the floor. ¡FantásticA! collectively hushed at the commotion, then resumed its regular noise level. The stock boy stood wide-eyed. “Yes, thanks, sounds real good,” she said, pushing her cart. Tears gathered in her eyes. She fanned them away and wheeled around what remained of the pyramid. Patricia quickened her pace, plunging deeper into the tangled emporium. The magazine section was more like an aisle of funhouse mirrors. Patricia passed covers of nearly naked too-skinny ladies and beefcake men with rippled muscles. The picture on the front of TIME, a soldier in tan pixelated camouflage, was not her oldest son Gabe, who’d been shipped out to the Middle East. She couldn’t have been prouder than if he’d actually volunteered to serve, rather than commuting his jail time. On Newsweek, a group of military men stood in dusty terrain. None were Gabe. She picked up the magazine and genuflected. Her first born, her little cowboy. But this was not about Gabe; this concerned Lynn. She put the magazine back on the shelf. The stacks of glossy covers bled into stationery, and stationery into greeting cards. Rectangular well wishes, thank yous, and apologies in a wide range of Spanglish dotted the shelves. Beyond the birthdays, a barrage of soft blues and pastel pinks and more damn exclamation points. Oh dear, she thought, shaking her head. No need for language. But then something worse than the boasts of baby congratulations commanded her attention. Her eyelids glazed past the gendered colors of newborns and gave way to the romance of red: ¡Feliz Aniversario! Denny hadn’t expected Buck’s right hook. The police hadn’t expected a brawl, not one with thousands of dollars on the line. Buck hadn’t expected jail time. To find out that this wasn’t the first time he’d bet it all, Patricia hadn’t expected that. Buck slept off his hangover on the couch while Patricia ripped open drawers and boxes, searched for bank statements, checkbooks, receipts. She sobbed and screamed, threw a real rowdy fit for no one. It had been a costly blind eye to turn. Oh, he had tried to change again and again over the years. Acted real sweet and good, wanted to get their marriage, their money, back on track. But maybe lying became too much trouble. After a while, he quit—not the gambling or the boozing, just the sneaking. He thought winning was penitence. Cracked a joke when he brought home more money than they’d seen for months, hung his head real low when he blew their meager savings. Patricia couldn’t live that way, not with a toddler daughter and a young son already acting out. She cashed in her own chips and started up full time with Veronica’s Housekeeping Services. Satan was laughing at her. No, maybe not the devil himself, but somebody cackled, a loud, evil snicker from behind her. Patricia whipped around to find the offender, her finger ready to wag. The aisle stood empty. Entranced, she listened to the creepy laugh loop. Suddenly struck by a thought, she considered her sanity: What if I’ve done lost it? What if this is it, I’m going crazy now, loca, losing it? But she wasn’t. The laughter emitted from one of the cards—a warped sound that slowed like a dying vacuum cleaner, sucking her towards it. She picked up the whooping card, the laughter now reduced to a low moan. On the front, a clown with giant shoes and a daisy boutonnière floated through the sky under a bouquet of balloons. ¡Espero que todos tus deseos se hagan realidad! Those Catholic school nuns would not be pleased with her Latin retention—she thought it said something about “all of the wishes.” Inside, the balloons popped up from the seam, hiding the tiny speaker that contained its dying laughter. ¡Feliz cumpleaños! She slammed the card shut, but the noise didn’t stop. “I ain’t got time for this!” she yelled at the card. Scratching and clawing it open, the pop-up balloons ripped away. She tore at the battery latch with her thumbnail, pulling the tiny power source out. The card fell silent, and Patricia squeezed shut her eyes. The mariachi music registered in her ears, drowning out her own panting. She did not know how much time passed, but she was breathing steadily again and the mangled card was still in her hand when her phone rang from deep inside her pocketbook, sparking her attention back to ¡FantásticA! Patricia placed the card in the cart on top of the bottles of pine cleaner and rummaged through her bag to find her cell. Sharon Nicholson’s name flashed across the screen. A bell went off inside her, or maybe it was the register in the distance. She and Sharon Nicholson had arranged to organize Senior Saturday Brunch at church. It was a rotation thing organized by church services, never on a set schedule. Patricia’d been picking up extra work all month, cleaning up after Christmas messes and helping take down old decorations. Some days she serviced as many as four houses. But Sharon Nicholson had a superintendent for a husband and a ring of diamonds on her finger. She didn’t understand hectic. With a groan, she pressed the button on her phone. Patricia’s mind floored like gas through a tank while Sharon chatted about her father and his gluten intolerance. Patricia’s eyes scanned the foodstuff while taking in a lecture on the evils of flour. Celiac was a disease that didn’t discriminate. But Sharon would make a gluten-free quiche, no small feat considering the scarcity of gluten-free biscuit mix. Senior brunch, senior brunch, Patricia thought and searched the shelves of junk food, dips and chips and cookies and soda. The options were about as appetizing as a slop trough, but there was no time between then and now to do a shop or make a dish. “Doughnuts!” Patricia exclaimed, relieved to finally find the long white boxes. “See you Saturday!” She hung up her cell and tossed a few more boxes in the cart for good measure. The tiny, overflowing cart had become a security blanket—a Mexican blanket, Patricia thought, allowing a tight smile to pass her lips. How much space could one little test take up, surrounded by so many other necessities? An announcement blared over the store PA system. Lynn checked her watch. It had to be closing time soon. She rounded the corner and finally arrived at the pharmacy section. Patricia found the organization of the medical supplies awkward. She blushed past the diapers of incontinence and menstrual necessities, things she found while tidying medicine cabinets and pretended not to see, until she found the family planning section, if you could call it that. Square black boxes marked “magnum.” Liquids and gels in an assortment of flavors. Oh my. A surge of relief was not what she expected to feel upon arrival at the shelf of pregnancy tests, but there it was, a hankering to grab a box and be done with it. Patricia caught a strange laugh in her throat. To think, you could pick up a box and trust it like a best girlfriend, one who would read the results and hold your hand through them. That trust could be bought or sold. “Trust” should come with an asterisk; a promise was never a guarantee. Patricia knew you could make a vow before your loved ones, before God, but a teenage girl didn’t know the scope of “for better or worse.” She certainly hadn’t. For richer or poorer had tested her holy matrimony, more so every time Buck nearly bankrupted them in a game of cards, dominos, or dice. She put back the box of promises and picked up another. An image of man and woman smiling over the white plastic stick stared back at her. A pink label displayed a beautiful woman gazing into her newborn’s eyes, the child’s mouth open in delight. She picked up box after box, searching for one without faces, without smiles or couples or babies of any sort. One fit the bill, just red squiggles and a no-nonsense font. “Unsurpassed Accuracy,” it claimed without emotion—no exclamation points at all. It was exactly what she needed after her daughter’s hysterics. Lynn had not confided in her mother often over the years, and this much truth sent Patricia’s head spinning. Her youngest grew up as detached as the runt in a litter of two, and especially after Gabe started acting out. Lynn hardly noticed her brother anymore, who had charmed her so when she was little. Her father, well, that was a lost cause. But why did the girl avoid her mother? A mean feeling like embarrassment flashed through Patricia. Sure, she cleaned the houses of her daughter’s classmates. But one day Lynn would understand the sacrifice. Still, her daughter’s cold disinterest reminded Patricia of stubborn residue, built up over time into a hard layer, unaffected by her scouring. As the pregnancy test dropped into the cart, Patricia’s autopilot switched on. She turned away from family planning and toward the registers. The tap, tap, tap of her shoes down the aisle and the occasional squeak of the cart’s front left wheel insisted she was moving, but she couldn’t be sure it wasn’t in circles as the aisles of the massive superstore blurred together—until she heard a clattering of glass knocking against the tile floor. Patricia’s vision snapped back into focus. At the front of her cart, an arrangement of candles flickered in tall glass votives. Two had tipped over, their flames snuffed out when she’d bumped them, wax dripping onto the linoleum tiles. Around her, shelves of veladoras, Mexican religious candles, caught the glinting light in their glass cases. Many houses that Patricia cleaned displayed such candles, but she’d always dusted around them without much interest. The imagery seemed too kitschy, macabre, even as a Catholic—skeletons in festive dress? An exploding golden heart in Jesus’ chest? Rainbow colored rows of veladoras surrounded her in the aisle, some with biblical images, others with words of prayer and affirmation, all uniform in size and shape. She was stunned to have missed such an obvious religious shrine, but who could have expected a blatant fire hazard on the floor of a so-called pharmacy? Trails of perfumed smoke rose from the wicks. Patricia righted the tipped votives, a red one and a white one, and dug through her purse for a lighter, a matchbook, something to reignite the darn things. On her neck, a prickly sensation, and Patricia glanced around the aisle. Only the praying Virgin Guadalupé and Jesus in his thorny crown stared back, trapped in their glass cases. For goodness’ sake. Shouldn’t there a separation between church and drugstore? Couldn’t He stay out of her pharmaceutical needs? Her daughter shrugged and retreated to her room. Patricia pretended it didn’t hurt. She had put the tickets back in her wallet, hoping Lynn might change her mind. Patricia suddenly dropped to the cold tile of the drug store, facing the altar. She closed her eyes and clasped her hands together. It felt more like negotiation than prayer, a bargain with her maker: whatever it takes. She would do whatever it took. Some time after Gabe left, Buck came home without his watch and his wedding ring, more tears and shame. Patricia decided then and there it was time to change her tactics of just hoping and praying. She stayed up late into the night, pacing the hall until finally, she went to her purse, pulled out a twenty dollar bill and walked over to the bookcase. The Jungle Book, a fat, fancy volume encased in a cloth slipcover, had been her own when she was a girl. She pulled out the book and reread her favorite, “Rikki-Tikki-Tavi,” about the brave mongoose that protects his family from the wicked cobras, before taking a knife to the pages. A perfectly rectangular canyon hollowed from the margins. She dropped the bill inside the gouged book and slipped the volume back in the cover, replaced it on the shelf. Patricia nodded, then shook her head back and forth. She didn’t know the answer. The woman pulled Patricia from the floor and handed her a lighter. Together, they relit the candles. Ambling toward the register, overflowing mini cart and mop bucket on wheels, the woman guided Patricia through the aisles’ twists and turns until a gate of registers stood before them. At the counter, the woman patted Patricia’s shoulder. Patricia nodded and shook her head. The final test, the last hoop: the cashier. The last obstacle on her way to completing her quest. The same uninterested teenage girl with hoop earrings and dark, fuzzy eyebrows that met over the bridge of her nose, stood at her register, cracking gum in her mouth. She was about the same age as Lynn. With a sharp breath, Patricia began unloading her cart. “Must be a big job,” the cashier said as she scanned the seventh bottle of lemon-scented cleaning product. Her English was perfect. “I work for a maid service,” Patricia answered, her eyes on the pregnancy test waiting patiently in the cart. The scanner beeped over the bottles. “Just let me pay for it,” Patricia said. “Whatever.” The cashier shrugged. “So you’re having a party?” The girl bagged the doughnuts. “Senior brunch,” Patricia replied weakly, wishing this would go faster. There must have been ten boxes of pastries in the cart. The cashier picked up the pregnancy test and scanned the barcode. It could have been anything, a chocolate bar, a box of soap, for the lack of interest the girl displayed. The register displayed a zero dollar cost. A middle-aged woman wearing small oval glasses came over when the clerk flicked her register light. They exchanged conversation in Spanish and the supervisor looked from the box to Patricia. “It’s for my daughter.” Patricia didn’t know why she said it. No one had asked. “Su hija,” the cashier translated for the manager. The woman came around the counter and wrapped Patricia in a warm hug. “¡Felicitaciones!” Her glasses mashed into Patricia’s coat. Patricia could practically hear the extra punctuation. The girl pointed at a veladora embossed with a multicolored Virgin. “And this?” The Mother of God. The woman with the mop must have put it her cart. “Yes, thank you kindly,” Patricia said in her flat accent. The girl pressed a button on the register. “High roller, eh?” the girl asked as Patricia handed her the bill. “I try to put them right in my savings.” Patricia stuffed the change back in her wallet. Patricia rolled down the window of her car despite the chill. The cold air sharpened every line in view—the lane dividers, the dashboard, the creases of the paper bags on the seat next to her. The car sped down the front road next to the interstate. Finally, a little luck, she thought, watching the traffic lights ahead of her turn green in sync. She raced home. What would she say to Lynn when she walked in the door? As she had left, her daughter begged her to hurry, tears spilling out like rain from a broken gutter. Perhaps she’d calmed down. Patricia would come into the bedroom and bear hug her, like Baloo with Mowgli. Together, they’d huddle in the bathroom, wait for the results, hand in hand. Patricia vowed to be reassuring and calm. And the results would be negative, God willing. They had to be. The amount of green-for-go traffic lights that lit the way home reassured Patricia so thoroughly that the first switch to yellow seemed a slight. Not even a colorful caution could slow her down. She stepped harder on the accelerator, but the traffic light demanded her stop by the time Patricia reached the intersection. The red hadn’t registered—Patricia stared beyond it to the road in front of her, past the University and east into the sprawl, up the path and down the hall and in the bathroom and on the plastic stick. She watched that strip so intently, daring it to change, that the force of the pickup truck smashing into the passenger side of her car hardly registered. Her car spun around, maybe more than once, and slid off the road into the ditches where streams formed after heavy rain. A loud tone rang in her ears, and she gently touched her face. The bottles crashed around the car the way they had inside the store. Blood ran sticky and warm, seeping through her clothes and onto the seats. Must be a big job. Dizziness overtook the pain, swirling and rolling her mind around. Her seatbelt locked hard against her chest, making it difficult to breathe or move. The car might have rolled over, she couldn’t be sure, but it lay on its side now, and gravity pulled her against the nylon strap. Turning away from the window that looked up to the sky, Patricia vomited. When she wiped her mouth, she saw blood on her hand. She squeezed her eyes shut. In her mind the lights changed from green to red, from white to pink, with lines and shapes and signs that said yes, but meant no. In the distance, faintly over the loud ringing in her ears, she heard shouts of people but couldn’t register their words. And then the shame flowed free with the blood loss, Patricia’s guilt mixed with the relief she had felt to finally have a piece of her daughter again. It was something—not preferable, these circumstances, but an opening, perhaps. After all this time, Lynn needed her. Though Patty prayed that her daughter would test negative, she couldn’t help being slightly, selfishly grateful for this opportunity. A stabbing pain shot through her side. She held that warm feeling, buried deep in her belly. The clamor faded into a muddled mash of noise around here. Please, Patricia thought, searching the sky. A band of stars arced above her in through blurred vision. A prayer, an offering, every breath in her body and beat of her heart—all was for Lynn. Patricia trusted Him to keep His end of the bargain. Her vision faded as the sirens screamed through the night. Everything would work out; it had to. Even God had a mother.